I bought it in white with dark blue stripes. Comes nicely wrapped. This is the second time I bought this item. I think it is elegant and beautiful. The first one seems great after several washings. Material is thin by design. My housekeepers use a hand steamer when making the beds (yes they are awesome!) and so the beds come out looking military precise - so classy. I rent my house part time as a super high end vacation rental in Palm Springs CA (8 bedrooms, 8.5 baths, private tennis court, pool, etc). My guests expect the very best for family reunions and other gatherings. These duvet covers are perfect and convey the right quality impression. I will keep buying them! I’m picky so yes these are nice!!! 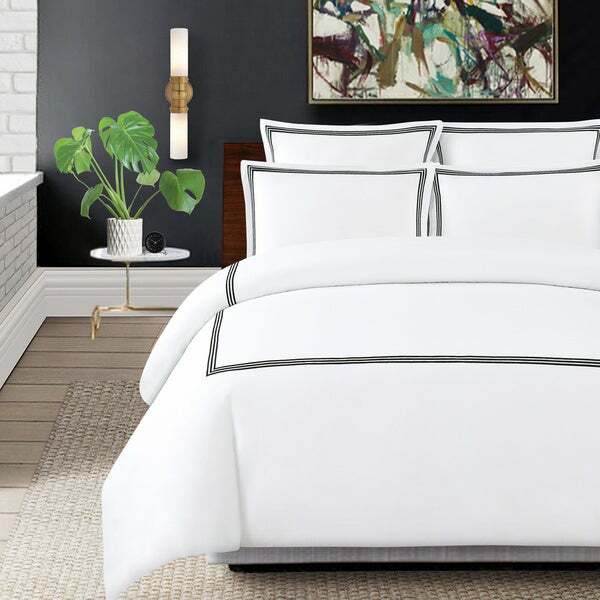 With 300 thread count cotton, a crisp white fabric, and a triple line pattern in a variety of elegant colors, this 3-piece duvet cover set marries comfort and class for a luxuriously soft and sophisticated night's sleep. The white background and variety of embroidery colors provide a beautiful addition to any decor. This duvet cover set is so chic and fits very well with my decor! The Echelon Home Three Line Hotel Collection is wonderful!! extremely satisfied with this piece, only wish it came with one extra set of pillow shams. I got the white lined duvet, but was also looking at it in the navy and light grey, i'm sure it looks great in any of the colors. I looked on several different sites for a set like this, and overstock had the best price, so that's what I went with. 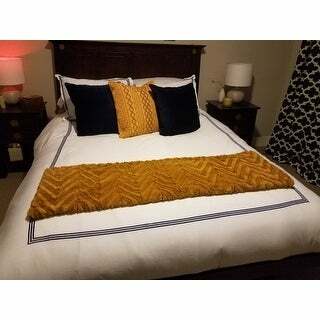 The material is thin- if you have a duvet or pillow with a pattern on it, it will be seen through the cover or sham. I followed washing directions, but ended up with frayed ends on the shams and serious wrinkles. I even ironed the shams (and I never iron anything because I hate it), and I could not get all the wrinkles out. (it did smooth out a little more once placed on the pillow, but the duvet cover remained wrinkled). Just not high quality. Of course, on other sites, I was looking at $*** for the set. Guess I got what I paid for. I love this duvet cover and sheet set. I purchased the white with silver and the coloring is exactly as it was represented. I like the quality of the material as well. I purchased this three piece set in the ivory embroidered pattern in a King size. It arrived just as pictured and fabric is very soft to the touch. 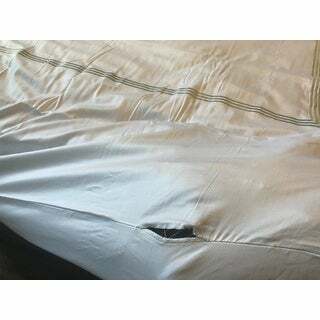 I cannot give it 5 stars because the edge of one pillow case started to fray after less than 4 months of use and a button on the end of the duvet detached. Otherwise I'm please with the purchase. I also bought the sheet set and euro shams and have had no problems with either. The crisp white duvet is perfect for our guest room. The dark gray embellishment is a nice contrast to the white cover. The pillow sham covers top off the bed ensemble. Love it. The duvet is quite thin and does wrinkle with use, but for the relatively inexpensive price, I'm okay with that. If you are looking for top quality, you will need to keep looking and spend more. I was in search of a blue-gray duvet to match my upholstered bed. 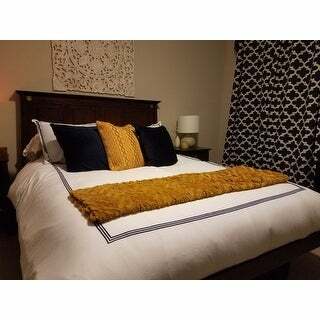 This duvet matched perfectly and the set was true to the description and photos. It does wrinkle heavily after washing, but the wrinkles iron out easily. Wonderful Sateen Cotton 3piece duvet cover! Looks very nice on my bed and does not wrinkle a lot. I would highly recommend this duvet to anyone for a clean look! This set wrinkles like crazy, even after steaming and ironing. It is also too small for our standard king sized bed. Wouldn't recommend. We’re very sorry to hear you are not happy with your purchase! We recommend removing from the dryer immediately to help avoid wrinkles from settling into the fabric, also our Quality Assurance team has found that steam ironing is effective in removing wrinkles. 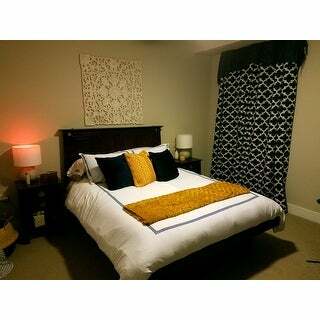 Please note that the king size is 105 x 90 inches, which is slightly larger than the industry standard. Perfect for the look I wanted in my room. Clean and simple. Washes and dryes great. I am designer and I ordered this for a client. I usually use this with other bedding to give the bed a layered look. I used a down alternative filler and it looked nice and fluffy rolled down across the bottom of the bed. I would purchase again. Terrible quality. As soon as I took it out of the box and put it on I noticed a rip in one of the seams. The stitching is very poor quality and will definitely not last. The material is soft but it’s basically two thin sheets sewn together. Not worth the price for what you’re getting. Overall this is a nice item however considering what I paid for it I was surprised to fine it had a hole in it that was about 2.5” long. Since the hole is in the seam and I have company coming in two days I opted to keep it and sew it myself rather than return it. Reviewed the Euro shames now the duvet set- as I said before, I love these. Simple and classy. Fabric is soft with a slight sheen. 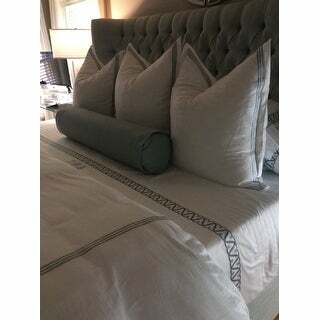 This set pulled my whole master bedroom 'Grey Retreat' together. Fabric was fairly thin; don't choose unless you have a white down comforter for inside. Additionally, be aware that the color described as silver (or silver blue) is in fact seafoam green. absolutely WOW. I was actually surprised by how high end this set is. 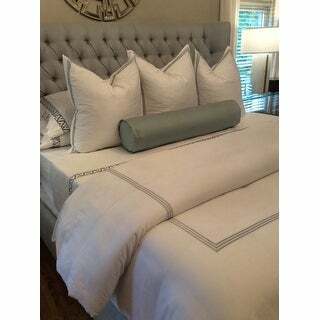 looks amazing on a tufted blue velvet king bed frame. super soft and bright white. Very soft fabric, it fits perfectly and the materials looks very well. This bedding set was what my room need it, classic look and modern at the same time. I felt that the piped colors was much darker than I had anticipated, in addition the weight seemed less than durable. Was replacing a similar duvet from Pottery Barn and it was truly apples to oranges so I returned it. Super thin material and the grey is more like a very light silver. Very nice quality. Better than I expected actually. I would give it a Hotel line quality. Beautiful fabric. It's important to note that when one purchases the king duvet cover, the accompanying shams are actually standard size, not king size. Still, a great value for a lovely product. "The standard size for king is102x96 so why would you tell anyone the standard is 102x90 thats not true. Most beds are at the least in need of a 96 inch in length over,"
"Do you hav to put blanket in side of it to make it work in like comforter looks like it has thickness await answer before ordering "
Yes. You definitely need a comforter of some sort inside. Otherwise, it would be the consistency of a double layer sheet. This listing is for the duvet cover and will need an insert. "Is the color we choose the stripe? " It does not at all. I even have a dog and a cat that lay on it. Not easily wrinkled. It is cotton, I would assume it will wrinkle with use. No, is pretty easy to Maintain and wash ! "Does the duvet cover have zipper or button closures?" "Does the king set come with king size pillow cases or standard?" What does the King duvet measure? Do you have California king, if so, what are the measurements? I bought the sheet set in light blue. Is there a Cal King in that size? "does this duvet cover have corner ties?" No. There are no ties. No it does not have corner ties.